Summary: Garvey can’t seem to please his father, who wants a football-player son, not one who struggles with his weight and hates sports. But Garvey’s good at chess, loves to read, and is interested in astronomy. Encouraged by his best friend Joe, Garvey overcomes his fears and tries out for chorus, where his talents really start to emerge. He discovers he has a strong tenor voice, and he even makes a new friend, Manny, a boy with albinism who shows Garvey how to ignore teasing and be himself. When the first concert arrives, Garvey is shocked to see his father wiping away tears after his solo. It turns out Dad was in a band way back when, and father and son finally find a connection through music. A note at the end explains tanka, a Japanese form of poetry used to write this story. 120 pages; grades 4-7. Pros: A brief novel in verse that lingers long after the first page. 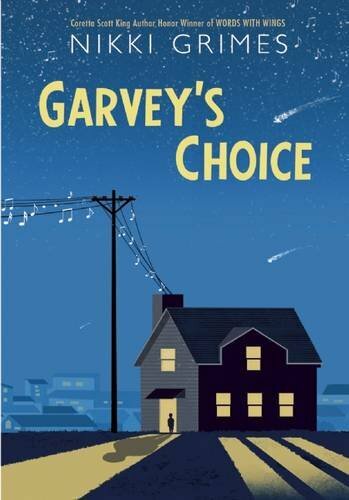 Garvey and his family are sympathetically portrayed, and readers will be rooting for him as he slowly finds his place in the world. Cons: At times, Joe and Manny’s advice seemed unrealistically wise beyond their years.